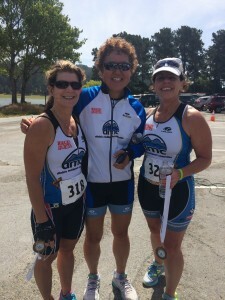 Tanya Parmley Harding, Sue Strause and Mia Okinaga placed in the Du Toes Duathlon on June 20, 2015. This Duathlon starts with a 3.6 trail run, followed by a 22 mile bike ride around the Bears, and ends with a 1.8 trail mile run. Wolf Pack Events put this race on. It is low key with very friendly and supportive race volunteers. Mr. Wolf was there and also did the race. There’s lots of great fruit and other snacks at the end. It is held at the San Pablo Damn boat ramp. Parking is easy. The race starts in the parking lot and you start climbing almost immediately. Once you climb to the upper level trail, it is easy rollers. It is an out and back. There is water at mile 1. The bike ride is straightforward. Once you get out of the park, keep taking rights through the bears and back to the park. The second run uses most of the same route as the first run. The hardest part is climbing right away. This was Tanya’s first Duathlon and she did super well with her pacing and transitions. It was fun watching from behind, how effortlessly she rode and ran.